When Taiwan first tapped into its huge wind energy potential, it did not expect a growing swarm of bigtime foreign developers pitching in. Foreign energy companies are highly attracted to the country’s geographical similarities to Northern Europe, conditions which are very suitable for offshore wind farms. The unprecedented amount of interest enabled the Taiwanese government to set an ambitious 3 GW offshore wind target for 2025, a move being mimicked by countries all over the region where massive renewable energy resources have yet to be fully unlocked. Experts stress that recent power challenges in Asia are proving that it is time to put these energy assets to good use, especially as the cost of wind power continues to plummet. From big names like China and India to more recent players like Vietnam and the Philippines, wind energy in Asia has been seeing major technological developments despite regulatory and cultural challenges. Asia led the globe in the number of new installations in 2016, with China maintaining its top spot for the last eight years and India following closely in the top five rankings. In fact, recent data from the Global Wind Energy Council (GWEC) show that China’s cumulative wind power installations are 3.4 GW more than all of the European Union combined. The Chinese offshore market began what many hope is the sector’s long awaited take-off in 2016, with China passing Denmark to achieve 3rd place in the global offshore rankings, after the UK and Germany. GWEC, however, forecasts that China will experience a slowdown in 2017. After taking off in 2016 and grabbing the 3rd spot in the global offshore rankings, the Chinese market will continue to face the major challenge of curtailment. Sawyer says that China’s National Energy Administration and State Grid is heavily working out transmission bottlenecks, amongst a number of other grid issues. Experts believe that China’s situation will improve over the medium term, but in the meantime, firms should expect a loss in profitability and greater competition. “At the highest level, delayed connection and curtailment represent a loss of potential and actual power supply, since the power that is lost is renewable and with minimal emissions of carbon dioxide and other pollutants, and is largely replaced by coal-fired power. This has a significant environmental impact, compromising the likelihood of China realising its ambitions for renewable power generation, and, by extension, its ambitions for emission reductions,” says Hanjie Wang, consultant, International Institute for Sustainable Development (IISD). Farther down south, India reached a new national record with 3,612 MW of new installations. According to the Global Wind Energy Outlook 2016, India is now the 4th largest market with a total of 28,700 MW. Sawyer says that they have great expectations for the Indian market, with certain expectations on offshore making a contribution in the country in the next few years. India also has a reputation for being a key market for low wind speed turbines, turbines which are generally on taller towers with smaller generators and larger blades, and operate with a higher capacity factor. Sam Fankhauser, co-director at Grantham Research Institute on Climate Change and the Environment, says that India undertakes process innovation by adapting European turbines to the Indian context, where wind speeds are lower. 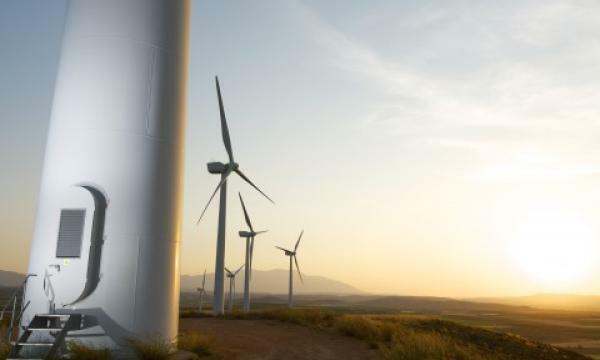 “India’s wind energy market is expected to attract investments totalling Rs 1,00,000 crore (US$ 14.9b) by 2020, and wind power capacity is estimated to almost double by 2020 from over 23,000 MW in June 2015, with an addition of about 4,000MW per annum in the next five years,” according to a report by the India Brand Equity Foundation. In January, Suzlon Group achieved the 10,000MW cumulative wind energy installations in India, a milestone capable of powering over 5 million households every year and offsets almost 21.5 million tonnes of carbon dioxide emissions annually. Suzlon Group believes that this achievement is equivalent to planting over 1500 million trees. Tulsi Tanti, chairman and managing director, Suzlon Group, says that it is heavily invested in helping the Indian government achieve its target of 40% renewable energy by 2030. The global wind sector is seeing more bright spots across Asia, with Japan, South Korea, and Taiwan set on increasing capacity in their offshore wind farms and Indonesia, the Philippines, and Vietnam working on onshore wind developments. “With the increasing penetration of wind power in a larger number of markets, differing experiences have shown that managing large penetrations of variable renewables (wind and solar) can be handled without threatening the stability of the power system, and indeed, in many cases it enhances it, as the system is less vulnerable to the failure of a single large source. Increased interconnection, improved forecasting and facilities for demand management only increase possible penetration levels,” Sawyer says. GWEC’s breakdown of countries shows that the growth in wind energy is deviating from the usual markets, as more countries explore their renewable energy potential and the need for cleaner power consumption. What once was a global wind market dominated by names such as the US, China, Germany, and Brazil is now a market being penetrated by the likes of Chile, Ethiopia, Iran, and Vietnam. Wind energy is a particularly attractive resource not only for its environmental-friendliness, but also for its cost. In a region where most of the countries are rich in natural resources and where most of these countries are developing, wind energy is definitely a priority consideration. “The fact remains that wind is one of the least cost options in many markets for new power generation, and this is even before factoring in environmental and health costs. IRENA estimates that doubling the global share of renewables by 2030 would save up to $4.2 trillion dollars annually thanks to avoided expenditures on air pollution and climate change,” says Adnan Amin, director general, International Renewable Energy Agency (IRENA). Vietnam, for instance, is located in the monsoon climate zone and has a 3,000 km long coastline. With average wind speeds of 5.5 m/s to 7.3 m/s per year, the country has very favourable conditions for the development of wind energy. Peter Cattelaens, head of project “Wind Power in Vietnam”, Deutsche Gesellschaft für Internationale Zusammenarbeit (GIZ) GmbH, says that the technical potential for wind power development in Vietnam is estimated to be around 27 GW, however only a measly 52 MW is in operation. Cattelaens adds that the Vietnamese government has set its own ambitious targets for renewable energy development. The National Power Development Plan (PDP VII) shows that Vietnam aims to increase the total wind power capacity from the current negligible level to around 1,000 MW by 2020 and around 6,200 MW by 2030. The country’s feed-in tariff of 7.8 USc/kWh is currently under revision to become more favourable for the ector’s commercial development. Ruth Briones, president of Greenergy Solutions, Inc., says that the Philippines has so far overtaken all other Southeast Asian nations in terms of installed wind energy capacity. The country now has an operational wind energy capacity of 400 MW, and the Philippine Department of Energy (DOE) is set to increase the installed wind energy capacity to 1,600 MW over the next two to three years. So far, DOE has identified 44 potential sites for setting up wind turbines which together can support 1,168 MW of wind energy capacity. This is part of the National Renewable Energy Program for wind power, which aims to reach a 76,000 MW renewable energy goal. For Asian countries which have a huge wind power potential, but limited land area, offshore wind power development is practically the way to go. In Taiwan, not only is the limited land area the primary challenge, but also pushbacks from nearby communities. Offshore wind in Taiwan offers a substantially higher FiT of NT$5.98/kWh compared to the FiT of onshore wind, which costs around NT$2.88/kWh. According to the Industrial Technology Research Institute (ITRI), a government-backed research agency, potential offshore wind power capacity in the Taiwan Strait is estimated at 15.2 GW. The average wind speed of 11 m/s is considered to be one of the best in the Asian region. However, Tim Ferry, associate editor, American Chamber of Commerce Taiwan, says that the country still lacks the experience and resources needed for offshore wind development. “Taiwan has been inviting experienced offshore-wind developers, primarily from Europe, to participate in building the market. For example, the foundations for all 32 of the offshorewind turbines planned for the Formosa OWF 128 MW offshore wind farm being developed by Swancor were designed by Danish engineering consultancy group COWI. As mentioned above, Swancor is currently trying to install two monopiles in the Taiwan Strait that would eventually support two 4MW Siemens turbines on 100 meter-tall masts, which will serve as prototypes for the entire project,” says Ferry. Ferry adds that the European firms are confident that facilities developed along the Taiwan Strait can withstand strong typhoons and earthquakes, with massive waves being the bigger challenge as they can pummel the windmills’ substructures. Waves in the Taiwan Strait can reach a maximum height of 19m during a typhoon, something that the European firms are not new to due to their experience of deploying turbines in the North Sea. “In early September, a group of American companies that included ABSG Consulting group, a marine and offshore certifications firm, along with Keystone Engineering from Louisiana and California’s Principle Power Inc., signed an MOU with representatives from Taiwan’s China Steel Corp., Taiwan Wind Turbine Industry Association, and the CR Classification Society under the auspices of the Industrial Development Bureau. The MOU is intended to apply the offshore wind technologies developed by Keystone Engineering and Principle Power to design offshore wind foundations better able to withstand the impacts of earthquakes and typhoons in the Taiwan Strait,” Ferry says. Recent data from IRENA shows that offshore wind farms in Asia, which amount to almost 1.5 GW, have mostly been deployed by China. Today, Europe takes the lead in offshore wind power development, with most of the capacity installed located off the North Sea or the Baltic Sea. The rapid development of wind power is forcing China’s original long term objectives to be constantly revised; indeed, China has now become the largest and fastest growing wind power generation market in the world. According to the statistics of the Global Wind Energy Council, the global cumulative installed wind power capacity has increased from 23,900MW at 31 December 2001to 486,749MW at 31 December 2016, with annual growth rate at 22.25%. During the same period, the annual growth rate of China’s cumulative installed capacity of wind power was 49.53%, ranking first in the world. In 2016, the new installed wind power capacity of China was 23,328MW, being 42.7% of global new installed capacity, making China the world leader. By the end of 2016, total installed wind power capacity was 168,690MW, being 34.7% of the world’s installed capacity and the highest for any country in the world. “The main driver for growth in the offshore wind industry has been significant decreases in power-generation costs, driven by advances in the technology. Cost reductions have been aided by government financial support to address the security of electricity supply and decarbonisation of electricity production. Such efforts have, in turn, driven innovation in the sector, which has brought costs down as well as boosting performance,” says Maria Ayuso, junior professional associate, IRENA. However, Bart Linssen, head of German wind-turbine maker Enercon’s subsidiary, SolVent, says offshore is not going as smoothly as planned. Linssen shares that they expect a return interest in onshore, and SolVent is proposing a 10 GW onshore wind power project that could generate employment and offer local investment, thereby overcoming community resistance for onshore projects. Linssen adds that the project would place Enercon’s 4MW turbines in areas where wind speeds average 7 meters/second, generating sufficient return on investment off of Taiwan’s onshore FiT of NT$2.88/kWh (US$0.094/kWh). Just like any other growing industry in the region, Asia’s wind markets face tough regulatory and market barriers that undermine their potential. Cattelaens says that Vietnam’s low FiT needs to be adjusted, alongside addressing other challenges such as missing finance, low data reliability, the lack of a systematic and consistent database, a deficiency in qualified human resources and technical infrastructure, as well as an inadequate supply of auxiliary equipment and services. “Complex procedures to undertake investments make it difficult for foreign investors to tap into the market. Local institutional stakeholders are unclear about procedures, leading to subjective interpretation and application of national regulations at the province level,” adds Cattelaens. Meanwhile in Taiwan, Ferry says that offshore wind developers are also emphasising the need for a stable regulatory environment, especially during the market-building phase. Better regulatory frameworks would enable developers to enter the market with confidence, thereby creating demand for local suppliers to meet. “Industry players also see a strong need for redevelopment of industrial harbors in Taichung and Changhua to meet the scale of offshore wind turbines that can stand 100 meters above the sea and have rotor diameters of 120 meters. Upgrading and expanding the grid will likewise be necessary to ensure the viability of offshore wind,” adds Ferry. Linssen says the Taiwanese government also has to create structures for easy setting up of community-invested wind farms and speeding up the permitting process. According to him, since all wind turbines are basically the same, he suggests general environmental impact assessments (EIA) and eliminating the need for a separate EIA for each project. Briones says that the Philippines is still hounded by challenges such as capacity allocation to location, site selection including geography, topography, wind, and resource, land clearance, suitable policy framework, wind turbine generator (WTG) technology, and power evaluation up to the grid. According to her, there is a need for long-term perspectives in policies which will provide greater regulatory and policy certainty to the investors and will help in attracting more investment in the state. Obviously, these challenges are normal for any growing market, and the general forecast for the Asian wind market remains to be a positive one. It is also pretty clear that whilst offshore is gaining all the buzz in Taiwan, most countries in Asia are focussed on maximising their potential via onshore wind power.